With the PM-3, Fender is serious about acoustics and it’s reaping rewards for us players. A cutaway with good playability, organic tonality and unhindered access thanks to the strap button placement. It’s crying out for an electro option. The mahogany tops have an indented texture to the grain that looks and feels vintage; a thin ‘open-pore’ satin finish leaves their organic looks unhindered. While we’re encountering more guitars in this price territory that aim for vintage Americana-style heritage, these models set a new standard for their price range. The PM-3 has a distinct area of appeal. It’s a more delicate sound with less low-end than the recently-reviewed PM-1, from the shallower depth, and it immediately feels like a welcoming home for fingerpicking, especially with the added player accessibility of the body. That satisfying roundness to notes is present and the bass still holds its own well in the balance rather than letting the mids dominate. The C-shape neck feels superb here with the lowest action of the trio, and proves itself the friendliest for lead. Which is just as well with a cutaway on offer. Access to the upper frets is even easier thanks to the placement of the strap button on the upper bout, rather than the usual neck heel. The trade-off is that this model feels a little neck-heavy on the strap. 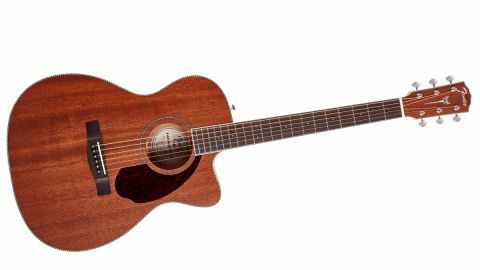 We would’ve liked to see the Paramount preamp offered, at least as an option - widening the potential appeal this design deserves - but as it stands, this is a solid-wood acoustic with a quality hard case.